Vintage Inspired Pinnies (V.I.P's) from ZippityDooDah. Each Apron design is inspired by vintage aprons and extremely limited edition! 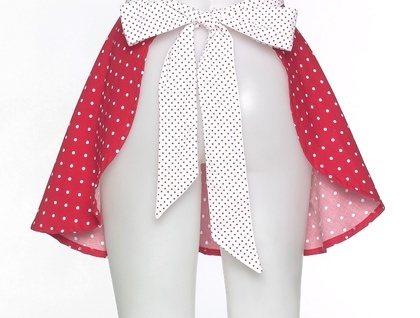 Dotty red half apron in a vintage style made up in Trelise Cooper fabric featuring classic red and white polka dots. I've teamed it up with a reverse mini spot fabric that I've used for the waist ties that tie in a fabulous bow at the back. It has a circular cut so quite gorgeous and flirty when you are wearing it. 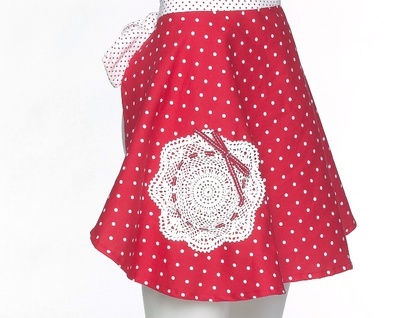 The front pocket are made from vintage handmade doilies with some red French ribbon trim. The waist band sits flat across the front with little pleats from the side seam to make the back ties more generous for a fuller bow at the back. You'll be the envy of your neighbourhood when you wear this little number! Looks great over your work clothes as you quickly rustle up dinner after a busy day at work, or equally as fabulous over your evening dress as you whip up gourmet delights for friends and family! One size fits all. 100% Cotton fabric. Machine wash,can be tumble dried. Waist ties mean will fit most sizes.